This tool kit specially serves for Nintendo products and many other game devices, useful and durable. SUITABLE FOR MOST MODELS - professional repair tool kit specially serves for your Nintendo Switch, New 3DS, new 2DS and more game consoles. 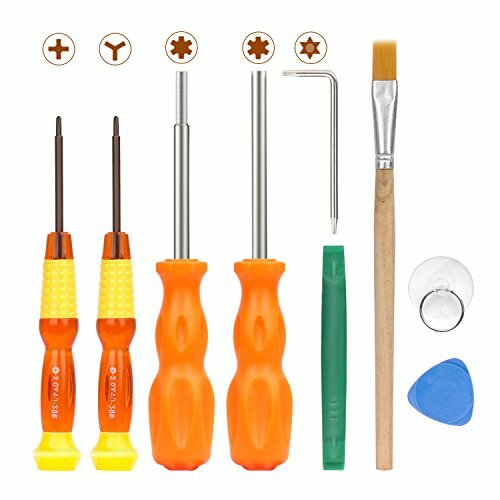 WHAT YOU GET - This tool set includes 1 x 2.0 Phillips Screwdriver, 1 x 2.0 Tri-wing Screwdriver, 1 x 3.8mm Security Bit Screwdriver, 1 x 4.5mm Security Bit Screwdriver, 1 x Short L Wrench(T6 & T8) and additonal 4 other tools will help you clean and remove the cover from the cartridge more safely and easily. 2.0MM SCREWDRIVER - This screwdriver will help triwing driver open including Nintendo Switch, NS, Wii, NDS, NDSL, DS Lite, GBA, GameBoy Original. 3.8MM SOCKET BIT - For Original Nintendo (NES), Super Nintendo (SNES), Nintendo 64 (N64), Virtual Boy, Original Game Boy, Game Boy Color and Sega Game Gear game cartridge. 4.5MM SOCKET BIT - For Sega Genesis System, Sega Master System, Sega 32x System game cartridge, Super Nintendo console, Nintendo 64 console, Virtual Boy console, Game Gear console, Game Cube console, TurboGrafx 16 console and TurboGrafx 16 console.